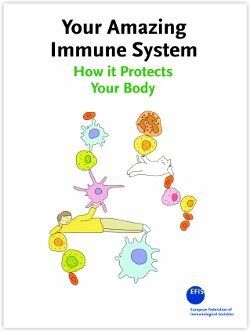 For the DoI 2009, EFIS first translated from Japanese to English a delightful text targeting children and lay people: Your amazing Immune System - How it protects your body. Several requests were since received from immunologists, patient organizations, educational facilities and laypeople worldwide, asking for the book in their own language, and to date, Your Amazing Immune System is now available in 19 different language versions. Indeed, the success of Your Amazing Immune System was also the inspiration for the development and release of an interactive educational web adaptation: www.interactive-immunity.net. The website includes quizzes and games, printable content, further reading and full .pdf versions available for dowloading of Your Amazing Immune System of the 19 translations thus far produced. The success of the project does indeed depend on active local immunologists, as regards to keeping the high quality of the book as well as its efficient distribution (e.g. via libraries, schools , exhibitions). Anyone interested in translating and publishing the book in further languages should contact EFIS.